Systematics and evolution of Iridaceae-with emphasis on African genera. Recent publications include systematic reviews of Babiana (c. 88 sp. ), published in 2007, and Hesperantha (c. 80 sp. ), published in 2004. The systematics of the southern African genus Ixia is currently under investigation. Ten new species of the Ixia rapunculoides and I. capillaris complexes were published in 2009 and a full revision of sections Hyalis and Morphixia is now in press with the serial Bothalia. With colleague John Manning we are working on a revision of section Dichone of Ixia which will include several novelties. We have also completed a revision of the African genus Ferraria, which now includes 18 species, four in tropical Africa. Our current research also includes a revision of the Africa genus Lapeirousia, this in collaboration with Felix Forest (Royal Botanical Gardens, Kew). Preliminary DNA-bases phylogenetic trees show the genus to be paraphyletic and the approximately 55 species of Lapeirousia will probably be allocated to three genera, two of them new. The Afro-Madagascan genus Aristea (c. 55 sp.) is also under review. Several new species were described by Goldblatt and collaborator, John Manning from southern Africa. A complete revision for Aristea in sub-Saharan Africa is planned for 2012.Flora of the Cape Region, South Africa. Cape Plants is a synoptic flora of the Cape region of southern Africa with family and generic keys, detailed distributional data and diagnostic descriptions. The flora of this region, a mere 90,000 sq. km, about one third the size of California, has about 9500 vascular plant species, about twice as many as that entire state. Published in 2000, Cape Plants has been extensively revised and updated. A new edition is scheduled for release in late 2011 under a new title although in effect is a new edition or the earlier volume.Index to Plant Chromosome Numbers project. The Index to Plant Chromosome Numbers is both a database and a hard copy version published in Monographs from the Missouri Botanical Garden. Until 2010 Goldblatt was editor of the project in collaboration with D.E. Johnson. The project, which aims to document original chromosome numbers published in the world’s scientific literature with references to their place of publication, has now moved from the Missouri Botanical Garden and will be overseen by IAPT. A new editor remains to be selected. Chromosome indexes published by the Missouri Botanical Garden with Goldblatt and D.E. Johnson as editors cover the world’s scientific literature from 1975 through 2006 are now in a searchable data base. Our most recent index, for 2004–2006 was published in the serial, Regnum Vegetabile. Listings of all counts for a genus of vascular plants can now easily be requested and dowloaded as a text file, vast increase in the utility of the data base. Counts for individual species can also be searched.Floral ecology and pollination of Iridaceae. Pollination by long-proboscid Diptera in the families Nemestrinidae and Tabanidae (rhinomyiophily) with probosces over 20 mm long, has been shown by Goldblatt and co-workers, J. C. Manning and P. Bernhardt, to be important in the reproduction of several southern African plant families, especially Iridaceae. Together they have documented the several species of fly and numerous species of plants entirely dependent on those insects for their pollination. The African Iridaceae have also been shown to be notable for their floral plasticity and show convergent evolution in many genera of species that have evolved similar flowers as they have shifted from ancestral long-tongued bee pollination to long-proboscid fly pollination or other systems using moths, scarab beetles, and wasps for pollination. These shifts are sometimes repeated multiple times within a genus, for example, in Babiana, Lapeirousia, Gladiolus and Hesperantha. 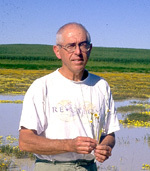 Goldblatt and collaborator J. C. Manning published a review of pollination in the Iridaceae in 2006. Their pollination studies continue with a study of the southern African genus Geissorhiza (ca. 90 spp.). Phylogenetic studies. A phylogeny of the Iridaceae with emphasis on the largely African subfamily Crocoideae (syn. Ixioideae), using molecular and traditional characters was completed in 2006 and a new subfamilial classification recognizing five tribes established. Analysis of the phylogeny of the family continues, and an article hypothesizing the Australasian origin of the family and a revised dating of the family using molecular clock techniques was published in 2008. The work includes a revised infrafamilial classification of Iridaceae, based on a plastid DNA sequence phylogeny. In order to maintain monophyly, the four subfamily classification recognized in the past, has been replaced by one with seven subfamilies. These are: Aristeoideae, Crocoideae, Geosiridoideae, Iridoideae, Isophysidoideae, Nivenioideae, and Patersonioideae. The Old World and largely African Crocoideae remains the largest subfamily with over half the total estimated 2250 species of Iridaceae. For Dr. Goldblatt's complete CV with list of publications, click here. Adaptive radiation of the putrid perianth; fly, wasp and bee pollination in the African genus Ferraria (Iridaceae). Pl. Syst. Evol. 278: 53-65. 2009 [with P. Bernhardt & J. C. Manning]. The Iris family: natural history and classification. Timber Press, Portland, OR. 2008. [with J. C. Manning]. Iridaceae "Out of Australasia"? Phylogeny, biogeography, and divergence time based on plastid DNA sequences. Syst. Bot. 33: 495-508. 2008 [with A. Rodriguez, M. P. Powell, T. J. Davies, J. C. Manning, M. van der Bank & V. Savolainen]. A revision of the southern African genus Babiana, Iridaceae: Crocoideae. Strelitzia 18: 2007 [South African National Biodiversity Institute, Pretoria and Missouri Botanical Garden, Missouri] [with J. C. Manning]. Radiation of pollination systems in the Iridaceae of sub-Saharan Africa. Ann. Bot. (London) 97: 317-344. 2006 [with J. C. Manning]. Phylogeny of Iridaceae subfamily Crocoideae based on combined multigene plastid DNA analysis. Pp. 399-411 in J. T. Columbus, E. A. Friar, J. M. Porter, L. M. Prince and M. G. Simpson [eds. ], Monocots: comparative biology and evolution, vol. 1. 2006. Rancho Santa Ana Bot. Gard., Claremont, CA [with T. J. Davies, J. C. Manning, M. van der Bank & V. Savolainen]. Radiation of pollination systems in the Cape genus Tritoniopsis (Iridaceae: Crocoideae) and the development of bimodal pollination strategies. Int. J. Pl. Sci. 166: 459-474. 2005 [with J. C. Manning]. Pollination mechanisms in the African genus Moraea (Iridaceae: Iridoideae): floral divergence and adaptation for pollen vector variability. Adansonia 27: 21-46. 2005 [with P. Bernhardt & J. C. Manning]. Phylogeny of the Afro-Madagascan Aristea (Iridaceae) revisited in the light of new data for pollen and seed morphology. Bot. J. Linn. Soc. 144: 41-68. 2004 [with A. le Thomas & M. Suárez-Cervera]. Pollination by fungus gnats (Diptera: Mycetophilidae) and self-recognition sites in Tolmiea menziesii (Saxifragaceae). Pl. Syst. Evol. 244: 55-67. 2004 [with P. Bernhardt, P. Vogan & J. C. Manning]. Floral biology of Hesperantha (Iridaceae: Crocoideae): shifts in flower color and timing of floral opening and closing radically change the pollination system. Ann. Missouri Bot. Gard. 91(1): 186-206. 2004 [with I. Nänni, P. Bernhardt & J. C. Manning]. Crocosmia and Chasmanthe: biology, classification and cultivation. Timber Press, Portland, OR. 2004 [with J. C. Manning & G. Dunlop; illustrations by A. Batten]. A synoptic review of the African genus Hesperantha (Iridaceae: Crocoideae). Ann. Missouri Bot. Gard. 90: 390-443. 2003.Radiation in the Cape flora and the phylogeny of peacock irises Moraea (Iridaceae) based on four plastid DNA regions. Molec. Phylog. Evol. 25: 341-360. 2002 [with V. Savolainen, O. Porteous, I. Sostaric, M. Powell, G. Reeves, J. C. Manning, T. G. Barraclough, & M. W. Chase].Plant diversity of the Cape region of southern Africa. Ann. Missouri Bot. Gard. 89(2): 281-302. 2002 [with J. C. Manning]. The color encyclopedia of Cape bulbs. Timber Press, Portland, OR. 2002. 486 pp [with J. Manning & D. Snijman].Radiation of pollination systems in Gladiolus (Iridaceae: Crocoideae) in southern Africa. Ann. Missouri Bot. Gard. 88: 713-734. 2001 [with J. C. Manning & P. Bernhardt]. Cape Plants: A conspectus of the vascular plants of the Cape Region of South Africa. Strelitzia 7. National Botanical Institute of South Africa, Cape Town. 2000 [with John C. Manning]. Fairest Cape Wildflowers. The wildflowers of the Western Cape, South Africa: where to find them and how to identify them. Redroof, Cape Town. 2000 [with J. C. Manning]. The long-proboscid fly pollination system in southern Africa. Ann. Missouri Bot. Gard. 87: 146-170. 2000 [with J. C. Manning].Pollination of petaloid geophytes by monkey beetles (Scarabaeidae: Rutelinae: Hopliini) in southern Africa. Ann. Missouri Bot. Gard. 85: 215-230. 1998 [with P. Bernhardt & J. C. Manning]. Iridaceae. In K. Kubitzki (editor), Families and Genera of Flowering Plants volume 2: 295-335. 1998. Springer Verlag, Heidelberg [with contributions from J. C. Manning and P. Rudall].Gladiolus in Southern Africa: Systematics, Biology, and Evolution. Fernwood Press, Cape Town. 1998 [with J. C. Manning]. The Moegistorhynchus longirostris (Diptera: Nemestrinidae) pollination guild: long-tubed flowers and a specialized long-proboscid fly pollination system in southern Africa. Pl. Syst. Evol. 206: 51-69. 1997 [with J. C. Manning]. The Prosoeca peringueyi (Diptera: Nemestrinidae) pollination syndrome in southern Africa: long-tongued flies and their tubular flowers. Ann. Missouri Bot. Gard. 83: 67-86. 1996 [with J. C. Manning]. The Woody Iridaceae: Systematics, Biology and Evolution of Nivenia, Klattia and Witsenia. Timber Press, Portland, Oregon. 1993. 138 pp. Phylogeny and classification of Iridaceae. Ann. Missouri Bot. Gard. 77: 607-627. 1990.An analysis of the flora of southern Africa: its characteristics, relationships and origins. Ann. Missouri Bot. Gard. 65: 369-436. 1978.